All you can eat (AYCE) Japanese restaurants are tricky. Orders tend to be forgotten, food quality may be questionable and service will feel harried. It can also get pricey if you’re looking for a wide selection (sashimi vs. nigiri, galbi vs. beef teriyaki) and good quality. Dinner prices on a weekend will normally go up to $25-$28 per person, and if drinks aren’t included you’re looking at a $35-$45 bill easy. For that price, you could eat a really good sushi meal that doesn’t trade quality for quantity (a good AYCE restaurant finds the optimal balance between these factors). Thus, the decision to AYCE or not really depends on your mood and company. 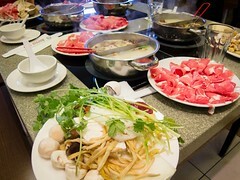 If you’d like to try a variety of dishes with a group of large appetites or choosy eaters, AYCE is a good choice. Everyone can order what they want and eat their fill. Yang’s Sushi Bar in Mississauga opened recently in May 2011, and it has another location in Markham that is consistently well-reviewed. 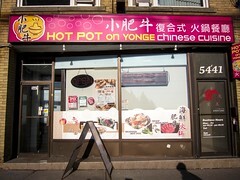 I’ve been to the Mississauga location twice now, once for dinner and once for lunch. The menu selection varies between the 2 meals as most AYCE places do (ie. sashimi at dinner only, more cooked items at dinner), but the selection was wide enough that you don’t feel restricted with the lunch menu. 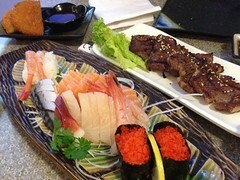 The raw fish is very fresh (tasting it stand alone, as well as in comparison to other AYCE places in Mississauga) and the nigiri sushi is sliced thick with a reasonable amount of rice, not giant balls. They also offered salmon and tuna roses on the lunch menu, which is made up of 3 pieces of salmon per “rose” around a ball of rice. There was a wide variety of rolls from spicy salmon to mango and black dragon. The spider roll is only available at dinner. I usually don’t order hand rolls at AYCE because they’re heavier on the rice content so we skipped that section of the menu and focused on the makis. The cooked food from the kitchen was well proportioned. An order of katsu don arrived in a small single serving bowl and there was no worry about filling up a single order, which allowed me to sample several of the udon and ramen dishes as well. The galbi and fried squid were both tender and not over-cooked to the point of turning rubbery. I would pass on the fried scallop (pictured) as it’s heavy on the batter and the takoyaki (pictures) was a touch cold. 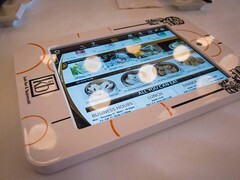 You can also order shrimp, yam and vegetable tempura separately, which gives a nice flexibility to the diner. Service wasn’t overly attentive, no one hovered at your table or checked in throughout the meal, but this is usually the norm at AYCE places. Servers needed to be hailed for tea/drink refills and to place new orders but everyone was pleasant and happy to help once you got their attention. Our bill for 4 adults came to just over $60 for lunch after tax. For comparison, the bill for 2 adults for dinner, on a weekend also came to ~$60 after tax when paying with credit. 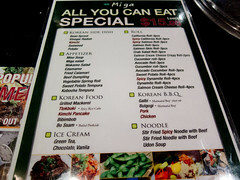 Quality wise, this is the best AYCE restaurant I’ve been to in Mississauga. I see myself visiting frequently in the future for lunches and the occasional dinner.